It became clear when Simon was a puppy that he needed a home base. He needed a place in the front room at which he could retire and “park it.” A space he recognized as his own. Also, he needed a place he could be tethered when his moods became too much. So, after trying out various sizes of kennels, it was decided to just get him a big dog bed to leave in the front room. My mom was mildly upset that yet another piece of furniture would take up space in our already crowded living room, but it could not be helped. 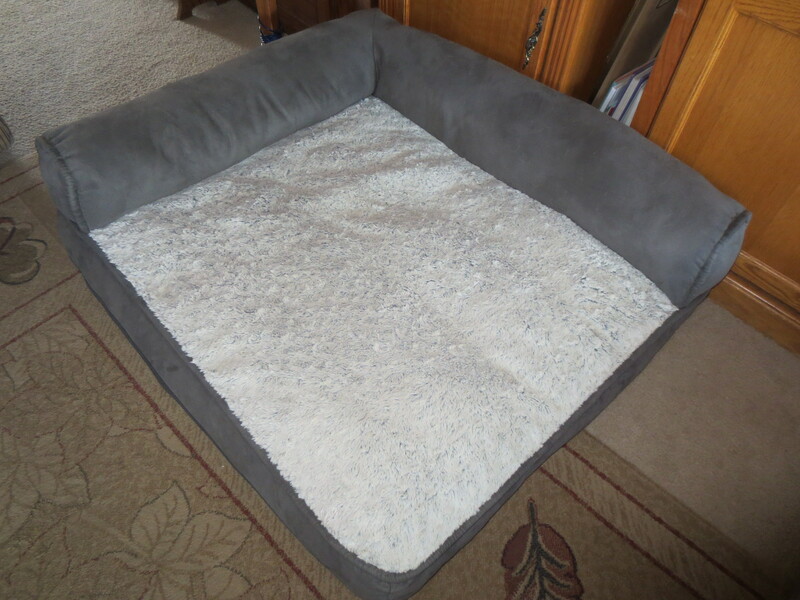 Theresa and I scoured all the local pet stores looking for a good quality dog bed that perhaps would not be torn apart in mere seconds due to a young Simon’s misbehaving (i.e. 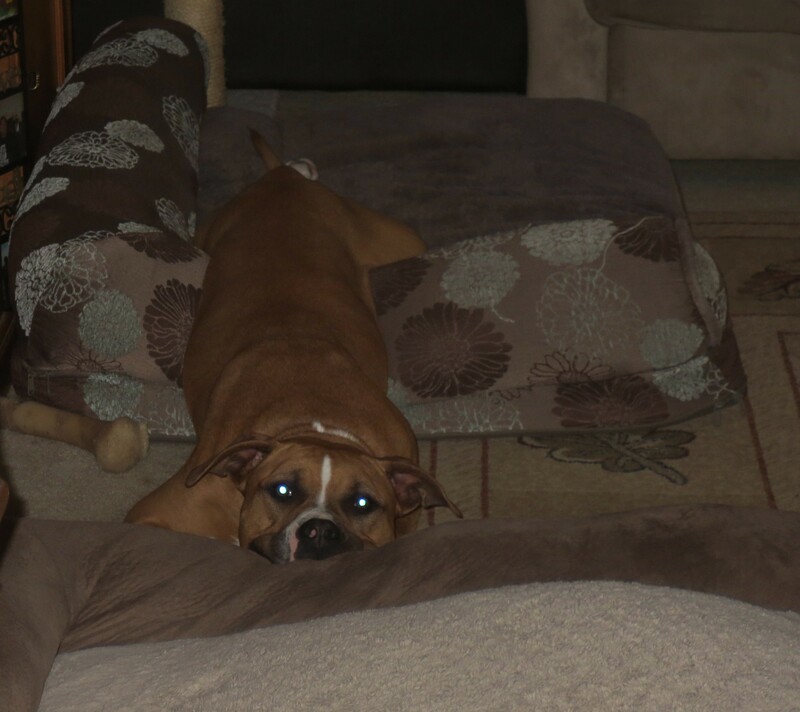 he liked to hump his bed, a LOT). There were, of course, the thin flat dog beds, but for me they lacked adequate substance. 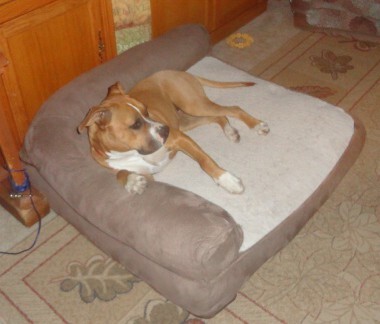 Next, we tested the slightly smaller round dog beds, ones with siding all the way around. For the most part this type of bed would not have been out of the question, except for the fact that Simon quickly outgrew most of the available sizes. This type of round, sided bed was clearly made for smaller dogs (at least it was in the pet stores that I searched). Then, there were the more upscale dog beds, you know the ones that literally look like smaller versions of your own bed frames with a headboard, footboard, and sideboards. Clearly, this type of contraption was out of the question to my more small-minded budget. 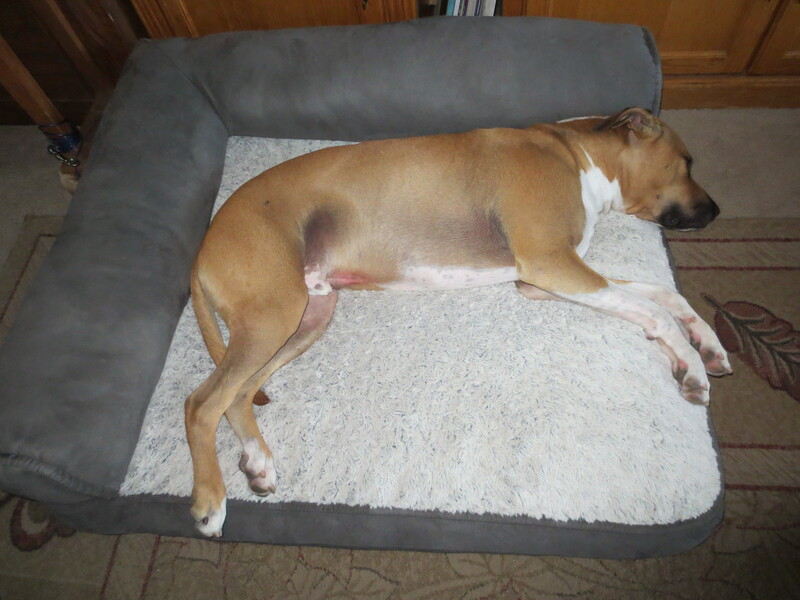 Finally, we discovered the ultimate dog bed—that is the Costco brand Kirkland Dog Bed. 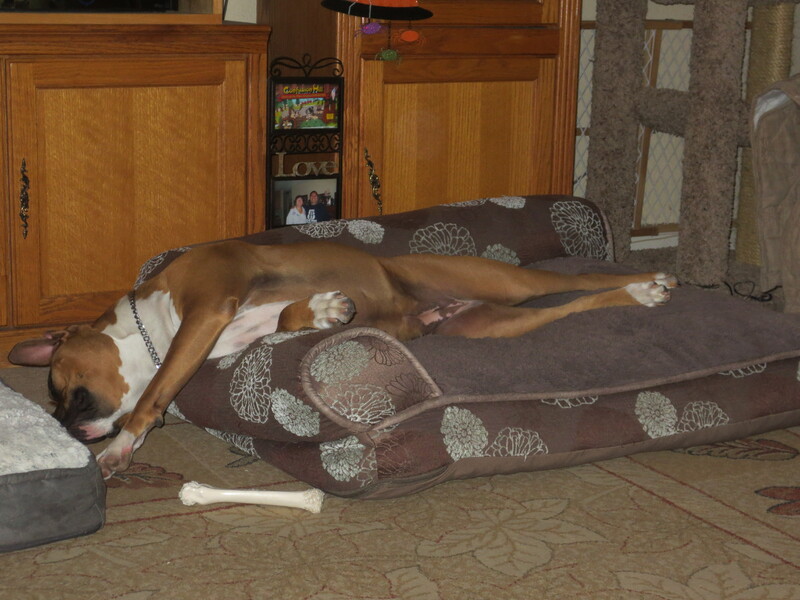 Now, the Kirkland Dog Bed is a big bed. It is approximately three feet long by three feet wide, with a height of about 4 inches. Across two connecting sides lays an extra pillow, thereby creating a side for a lazy pup to lean his or her head on. Needless to say, this pillow is greatly appreciated by both Simon and Rosee. When I first brought this bed home, Simon wasn’t sure what to do with it other than play. He would drag it around the living room, hump it, nibble on the fabric, and generally do anything but sleep on it. Slowly, he discovered the bed’s ability to be a nice, comfortable resting place and soon gave in to its sleep-inducing qualities. 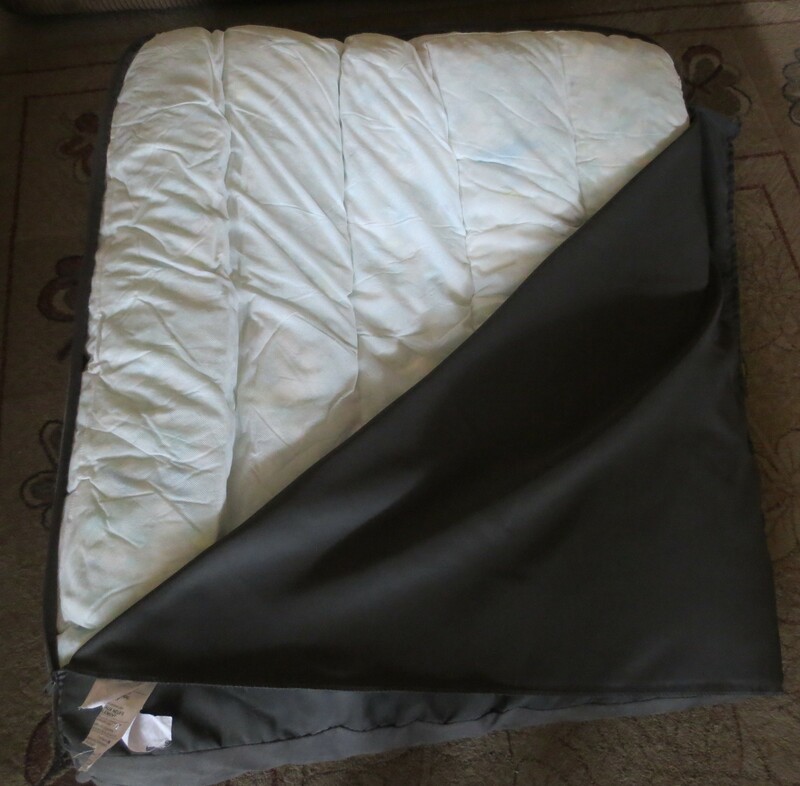 The nibbling still continued, much to my dismay, and after a year of wear and tear small holes turned into big holes, the mattress itself smelled distinctly of urine (courtesy of puppy Simon being a vindictive little bugger) and it was time to replace it. 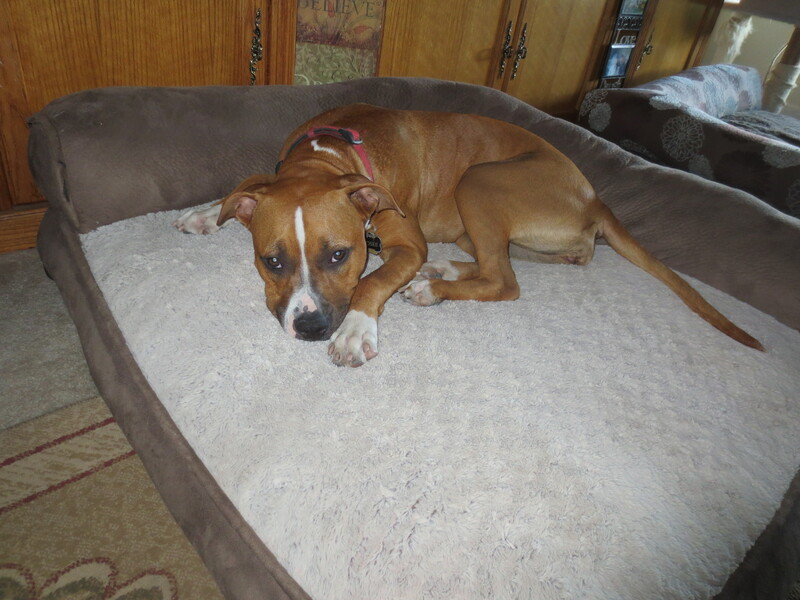 Rosee’s love of the bed came a lot more swiftly than Simon’s. The minute we brought her home after adopting her she immediately laid herself on Simon’s bed. Clearly, her message was “Get me one!” So, off to Costco I went and came out with a brand new bed, complete with a flower pattern because her name is Rosee after all. Rosee has been much nicer to her bed over the years, not nibbling on it or making holes, so it is still in really good shape. And given the amount of time she spends lounging on it, it’s incredible how well the mattress has held up. It still looks as fluffy and firm as it did when I bought it! Newly adopted Rosee making herself comfortable on Simon’s bed. Aside from the beds being large enough to accommodate Rosee and Simon’s entire bodies, even when stretched out, and still holding firm, the GREAT thing about these beds is that the covers come off! You can completely undress the beds, taking out the mattress bottom and pillow siding, so that you can wash the cover. Color me impressed! The fact is Simon and Rosee lay on their beds i n the morning, in the afternoon, and at night. They lie down after rolling around in the grass and dust in the backyard, after a walk, and after running around the house. Basically, whatever dirt and dust from the outside world that has found itself stuck on Simon and Rosee’s coats will without a doubt be rubbed onto their beds. After about a week or two, especially in the summer, their beds can start to smell . . . like dog. So, while Simon and Rosee get baths out on the front lawn, their beds’ covers get washed. The covers come out of the dryer smelling nice and clean, and Rosee in particular enjoys snuggling up to the slowly waning warmth of a reassembled bed. 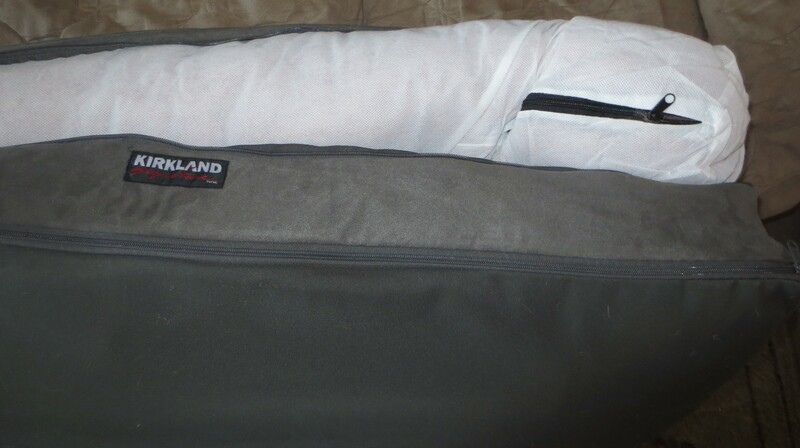 The side pillow has a separate zipper from the bottom mattress. Now, let’s talk about the important details. This specific dog bed is only available at Costco, so unless you are a member or know a member you will have a tough time acquiring one. Also, these beds are about $50 each. $50 is a lot, don’t get me wrong, but it’s a large bed that you can take apart and it lasts. Rosee’s bed is closing in on the end of two years, without much wear showing. Simon, as I mentioned, is on his second one, but that’s because his first had to be sacrificed to potty training. You see, my family bought his bed when he was a puppy, so he could grow into it, except that Simon really liked to pee on it. They say dogs can’t be spiteful, but “they” apparently haven’t met Simon. I swear he used to go stand on his bed, stare at you, and then start peeing right in the middle of his bed, doing so because you just told him “no” about something. (Let me just say potty training Simon was certainly a long, long experience that I would not like to repeat ever again.) By the time Simon was about a year old his bed’s mattress had been sprayed and disinfected so many times that no cleanser or deodorizer was having any effect and a smell was starting to emit. So, Simon’s bed was replaced with an exact replica, and it is seeing the beginning of year three still looking and feeling brand new. Initially spending $50 hurt a little, but these beds have been worthy investments that keep on giving. She loves to use the side pillows to the fullest extent. Overall, I love the Costco Kirland Dog Beds, and most importantly Simon and Rosee love the beds too. While a little bit costly upfront, the ability to wash the cover, the larger size of the bed, the pillow siding, the firm mattress, and the lasting durability certainly make this bed worth the price. I’d say it’s a match made in doggie dreams. Even after all this time she’s still taking what’s his.